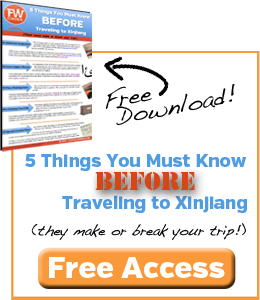 Living in Xinjiang has been a non-stop adventure for me – I love it! I have incredible memories of experiencing local festivals, traveling the province on my motorcycle and visiting small villages near the border of Kazakhstan. Memories like these are often created but every once in a while they just appear in front of you without any prior planning. That’s what happened to me this week when I stumbled upon a mass wedding of 100 Uyghur couples in Turpan. Before I dive into the story, take a look at this short 2-minute video I produced from the footage I was able to gather. Click here to keep up with all the FarWestChina videos! Last Wednesday I was driving into Turpan, waiting for about half an hour at a checkpoint on the east side of the city. 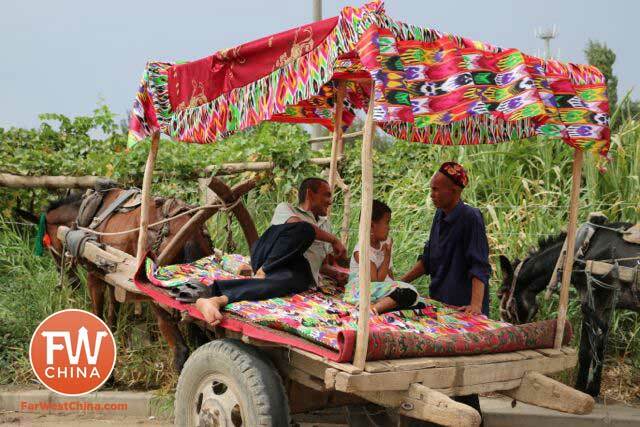 All ID’s were being checked and every vehicle was being stopped – including quite a few well-adorned donkey carts. I didn’t think much of it at the time but snapped a quick picture just because I thought it looked fun. After about an hour in the city I was driving toward the lake on the east side when I stumbled upon over 25 of these donkey carts lining the road. It was incredible! I immediately parked the car and jumped out to see what was happening. “What’s going on here?” I asked a lady nearby. “It’s a wedding!” she told me. She was obviously helping to organize the event and I had a hard time believing that anybody would need so many carts for a single wedding. “All of this for one wedding?” I said, my face more than likely conveying the confusion I felt. 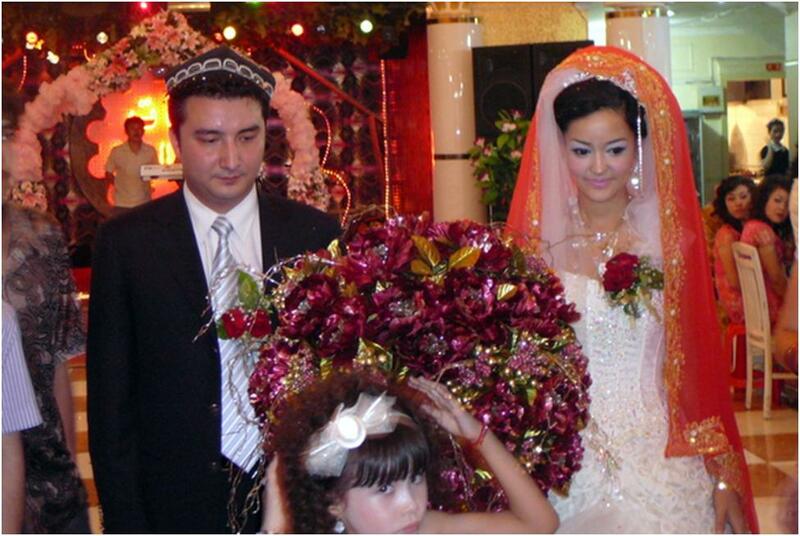 It was at this point that it dawned on me: this was the mass Uyghur wedding that has been held as part of the Turpan Grape Festival every year. I had seen Chinese news outlets report on this event before but had never seen it up close. 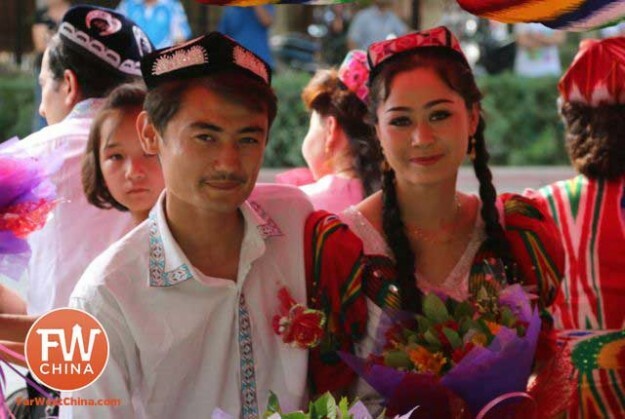 I haven’t been able to verify this but I believe the reason for the mass Uyghur wedding is because it seems to be a win-win for the community. 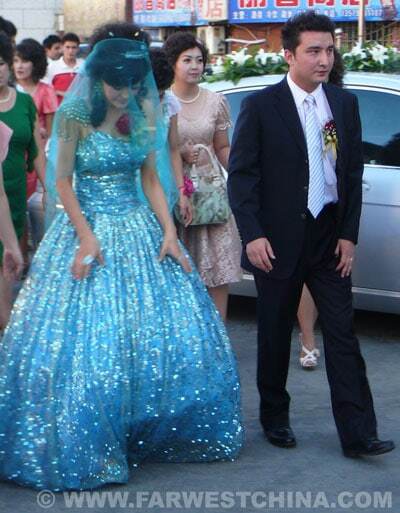 Think about it: the Turpan government pays for a grand parade that includes the marriage of 100 Uyghur couples who more than likely wouldn’t have been able to afford a lavish Uyghur wedding. These couples get a free wedding and the local government gets to make a public display of how much it cares for the minorities. I spoke with a few of the couples who were patiently waiting on the carts for the festivities to being. The men weren’t particularly dressed up – most just had white shirts and dress pants on – but the women wore a wide array of colorful dresses that were absolutely beautiful. One couple I spoke with were from a nearby village. Both were 24 years old and their families were here to witness the parade and ensuing ceremony. They seemed genuinely happy to be there, if only for the fact that they were being paid so much attention. Reporters from CCTV and various other news outlets were on hand to photograph and interview the newlyweds. Police were working hard to shut down the streets and push the onlookers back to the sidewalk. At 7pm the parade began. I was amazed by how big this event was. Groups of Uyghur and Han performers filed by me engaged in some form of dance or entertainment. 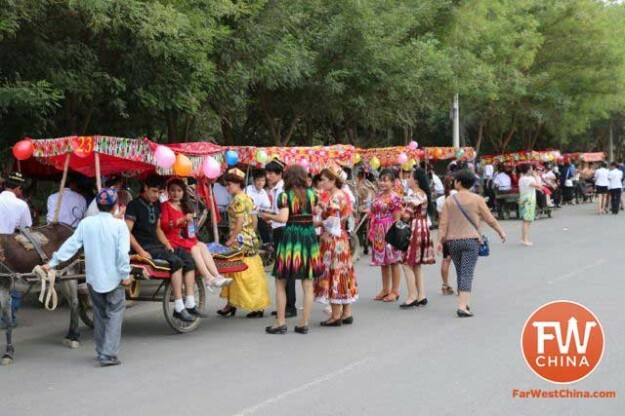 The entire event consisted of over a thousand performers doing everything from traditional Uyghur dancing to that Chinese dance popular with old Han women. Sure, the whole thing was a publicity stunt to promote harmony between the ethnic groups but I thoroughly enjoyed it! It’s better than the same old story of increased military presence, that’s for sure. Heh, brings to mind reports this week that some town or other out there is paying mixed Han-Uighur couples to marry and stay married, with benefits, including cash, for five whole years! As for most of the guys just wearing white shirts in the mass wedding you saw…well, you know these ceremonies are just for women — no guy really cares about the big communal to-do! Just saw this post and loved it! The video was great too. Thanks for sharing! Would’ve love to see that. Ha! Thanks Sarah. Glad you finally saw the post ;) Maybe next time you guys can go with us to Turpan? Make it up to the Altaic region if you can- in August the wehaetr should be the best. Heaven Lake north of Urumqi was one of the most beautiful places I’ve been, once you ditch the tourist areas. Of course, the further north you get the more you would need to get your own vehicle since the roads aren’t great.Urumqi is only good as a rest area in between, I agree. The more interesting places are definitely Kashgar and Turpan (Kuche not so bad as a point to see other stuff). Great place.